MnO2 is 2D catalytic and electronic grade semiconducting 2D material. In the bulk form, MnO2 has 1.5 eV predicted band gap while it has been anticipated to increase to 2.0 eV in the monolayer form. Starting from single crystalline MnO2, our R&D team has created MnO2 solution in isopropanol solution. Synthetic MnO2 crystals have been synthesized at 99.9999% purity and they have been dispersed into isopropanol (electronic grade isopropanol solution at 99.9999% purity) by ultrasonic treatment. Since the starting synthetic MnO2 is highly crystalline, resulting MnO2 solution yields highly crystalline MnO2 sheets suspended in isopropanol solution. 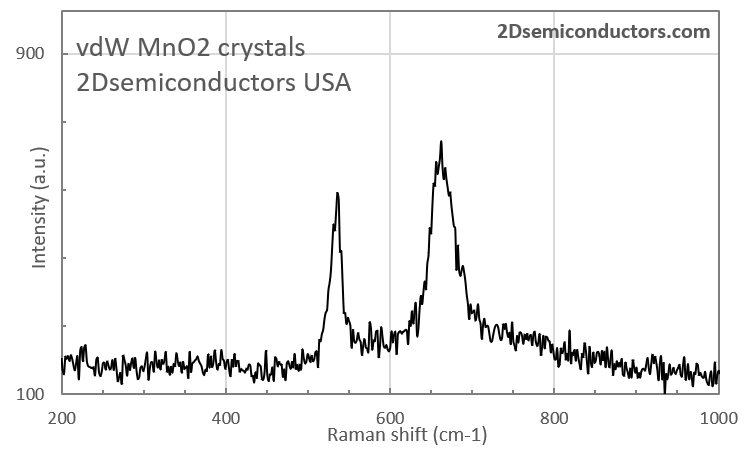 Lateral sizes of MnO2 flakes range from ~100nm - ~30 um while thickness range from 1L to 10s of layers. Solution type: By default 2Dsemiconductors USA will provide MnO2 sheets suspended in isopropanol owing to good dispersion, stability, and high performance. However, if your research requires other solvents, please contact us for more details and schedule for the product delivery. Solution concentration: To reduce shipping costs, easy customs agreement / border check-in processes, we ship supersaturated 2D solutions (~80-120 mg/L depending on the type of 2D layers). However, supersaturated solutions can be diluted to produce ~250-500mL of solution to deposit 2D layers onto desired substrates through simple and cost-effective spin-casting process. Starting MnO2 crystal quality: Environmentally stable delta (layered) phase of MnO2 has been synthesized using float zone technique at centimeter scales. In its delta-phase, MnO2 crystal structure assumes R-3m phase (see images) which contains layers stacked onto each other vdW bonding. Each layer has three atomic thick arrangement consisting of O-Mn-O layers as shown in the diagram in product images. The material is environmentally stable in air, water, and different gases. Layers can easily exfoliated onto desired substrates with minimal efforts as shown in the product images.